Also available as Ebook: EPUB and Kindle. 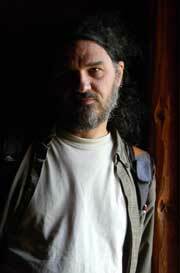 Paul Gosselin is an independent researcher specializing in ideologies, belief systems and religions. He holds a Masters in Social Anthropology and is the author of Hors du ghetto (on culture and the arts), has done years of investigation into post- modernism. He has lived in Nova Scotia, California, Vancouver Island and currently resides in Quebec. Cynical Observations on the Postmodern West. 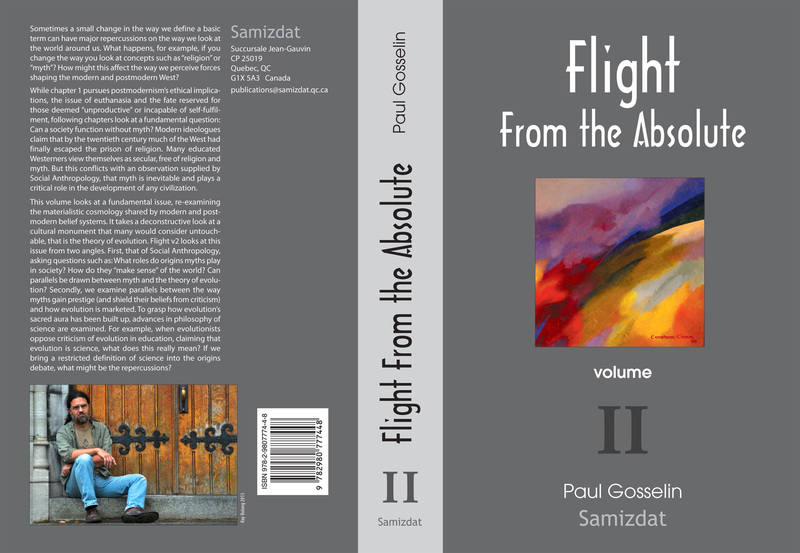 Flight From the Absolute Volume II pursues the study (initiated in volume I) of postmodernism's ethical implications and examines issues such as euthanasia (now massively promoted in the postmodern West) and the fate reserved by postmoderns for those with disabilities, those deemed to be leading "unproductive lives". A mercy killing case, that of the Canadian farmer Robert Latimer who killed his daughter Tracy suffering from cerebral palsy, is considered. Subsequent chapters shift their focus and address a fundamental question: Can a society function without myths, particularly origins myths? This is a critical issue for modern Western civilization as our elites often assert they have "dispensed with" myth and religion. That said, Social Anthropology points out that origins myths play an extraordinarily important and central role in the development of any culture or civilization. This work takes on a fundamental issue, that is the deconstruction of the materialist cosmology, which is shared by the modern and postmodern belief systems. Flight From the Absolute volume 2 offers a hard-hitting and provocative look at a cultural monument that many consider untouchable, that is Charles Darwin's theory of evolution. For this purpose, data from both Social Anthropology as well as Philosophy of science are examined. This deconstruction process leads to a review of claims made by heirs of the Enlightenment and will dissect the fundamental question of science's limitations as well as the censorship which may be used against academic cosmological perspectives that are deemed "unorthodox." Flight volume II thus examines the theory of evolution both from the perspective of Social Anthropology and Philosophy of Science which exposes multiple social and ideologico-religious roles played by Darwin's theory. Inevitably, such a perspective maybe viewed as "subversive" by some as it involves a fundamental deconstruction of Enlightenment dogma about Truth and the hierarchy of knowledge. As the reader works his way through this text he will encounter the American novelist Kurt Vonnegut, Austrian philosopher Karl Popper, Tracy Latimer, Charles Darwin, the Council of Europe, microbiologist Richard Lenski, French paleoanthropologist Anne Dambricourt-Malassé, mythology specialist Mircea Eliade, palaeontologist Stephen Jay Gould, zoologist Pierre-Paul Grasse, Franco-Polish anthropologist Stoczkowski Wictor, Canadian philosopher of science Michael Ruse, biologist Ernst Mayr, Mary Midgely, French phylogeneticist Guillaume Lecointre, Julian Huxley, Physics Nobel Prize winner Robert Laughlin and many others. 8 / Annex: What is a "Creationist"?